The president gave an address geared to both a national and local audience. In a speech that alternated between appeals to national and local audiences, President Donald Trump urged Montanans to vote out incumbent Democratic Sen. Jon Tester while also railing against hot-button issues like the caravans of Central American migrants making their way to the southern border. “The Democrats want to invite caravan after caravan of illegal aliens to flood into your communities,” the president said, speaking to a hangar full of supporters near Bozeman airport. 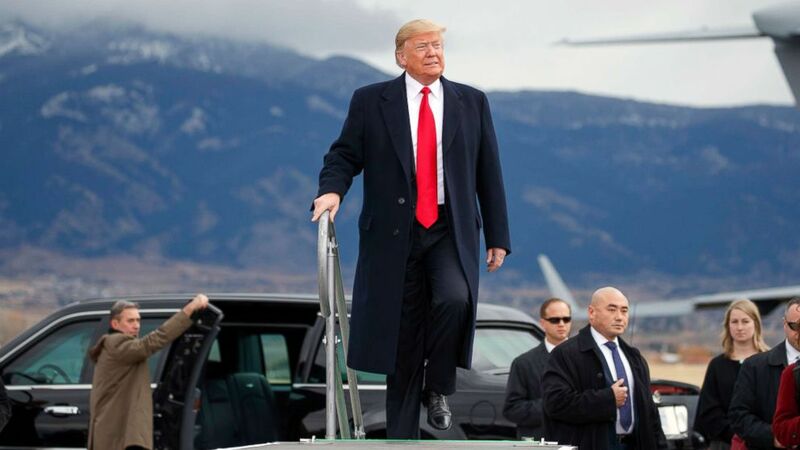 It’s an issue that many Montanans who were in line to see the president speak on Saturday said was important to them, although they added that they had long been concerned about illegal immigration and that they weren't worried solely because of the caravans. “My view was pretty much already set in stone," Matt Woody, a plumbing contractor in Bozeman, told ABC News. "That just kind of reinforces the need to close the border and regulate who’s coming across. We can't even find apprentices right now, or laborers, and there's a huge need for [a] work force, but I think they should be legal. I don't think they should just come across the border." Trump also hailed the deployment of thousands of active-duty U.S. military personnel to the border, praising them and then lauding the addition of barbed wire at parts of the border. He also reiterated phrases from the past to describe the caravans, three of which have mobilized so far and are making their way through Mexico. The "list" he referred to was a statement from the Department of Homeland Security stating that over 270 of the thousands of individuals in the various caravans have criminal histories, including gang membership and crimes involving robbery and sexual assault. He also warned of additional caravans forming in Central America. “Now they have worse caravans actually being formed. It’s terrible,” he said. (Evan Vucci/AP) President Donald Trump at a campaign rally at Bozeman Yellowstone International Airport, Nov. 3, 2018, in Belgrade, Mont. Trump mocked TV pundits who say he should be talking about the booming economy instead of stoking fears about what he has called an “invasion” on the southern border. “CNN is telling me how to run the campaign, but in the meantime, I’m president and they’re not,” he said. Not everything was about Democrats and the media. The president talked up the strong economy, evident in a record-low unemployment rate, higher year-on-year earnings and steady job growth at the beginning of his remarks. But immigration was the issue he kept returning to, despite the fact that Montana has one of the lowest percentages of undocumented immigrants of any state, according to a 2014 Pew Research Center survey. Yet, despite having such low numbers of illegal immigrants, most Montanans that ABC News spoke to said the issue was at the top of their minds for this election cycle. “Immigration’s left our country unsafe. It’s taken jobs away from workers," Todd Green, who runs a high-end stereo equipment business in Three Forks, about 30 miles from Bozeman. "I have no problem with legal immigration. Bring in legally as many workers as we need. But as far as people breaking the law, who come here, it’s not right." During the speech, Trump riffed on reports that a little-known accuser of Justice Brett Kavanaugh had recanted her allegations of sexual assault. Senate Judiciary Committee Chairman Chuck Grassley referred the woman, Judy Munro-Leighton, to federal investigators. He also suggested that other accusers may follow suit. Christine Blasey-Ford, who testified under oath before the Judiciary Committee about her allegations that Kavanaugh sexually assaulted her, has maintained her account of events. Kavanaugh has denied the allegations. The rally marked Trump's fourth trip to Montana this election cycle. He acknowledged that it has much to do with his personal animus toward Tester, who as the top Democrat on the Senate Veterans Affairs Committee expressed concerns about alleged inappropriate behavior by Trump’s VA secretary nominee, Admiral Ronny Jackson. The allegations prompted Jackson to withdraw from consideration. “He tried to destroy Admiral Ronny Jackson. Who is the most clean-cut, wonderful person you’ve ever met," Trump said. "He tried to destroy him and I’ve never forgotten it, and honestly, it’s one of the reasons I’ve been here so much." For Montanans who were there to see Trump, though, there are different reasons to oppose Tester. Jon has not done the job that he's supposed to have been doing for the 12 years he's been there now," Tom Buckmaster, a resident of Bozeman, told ABC News. "It's time; we need a change."